Marsden appears to be playing the role of Officer Wachowski (according to the name badge), who was spotted spotted working on set in costume on the streets of Vancouver, Canada, where filming began last week. As always, TSS will keep you updated on all Sonic the Hedgehog movie revelations! < Previous Post Previous post: Sonic Mania Cheat Codes Discovered! 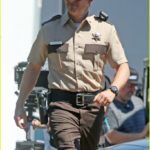 Am I right in thinking that’s a county sheriff uniform? Oh god is that a British Columbia license plate? Tell me where this is filming so I can avoid the traffic it causes. Reply if this is the least Sonic thing you’ve seen connected to the Sonic film.